Coastal Bend College oil and gas students Sean Smith and Walter Richardson, both of Beeville, recently returned from a four-day workshop in Houston. A $2,500 stipend, paid by Weatherford, made it possible for two CBC students. The company plans to send two to four CBC students to the four-day class each year. Weatherford International gave two Coastal Bend College students the opportunity to learn about artificial lift systems in the field. 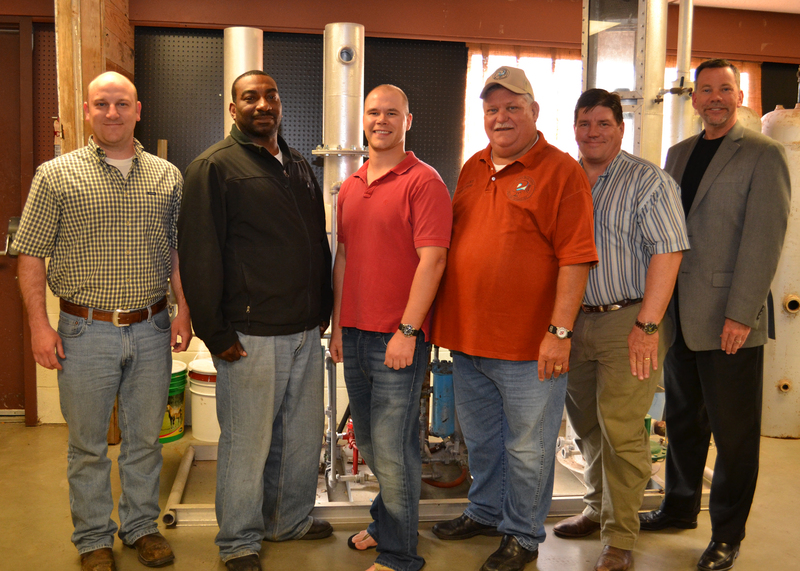 Pictured are, from left, Blake Snow of Weatherford International; CBC students Walter Richardson and Sean Smith; CBC Oil and Gas Instructor Roy Coley, CBC Drafting and Design Instructor Jack Young and CBC Dean of Instruction Dr. Bruce Exstrom. Coley said students get a solid education in his program, but nothing compares to getting out of the classroom, into the real world, to interact with working equipment and professionals. “I can talk all day, but the minute a student touches or sees something, it all clicks into place,” Coley explained. The oil and gas program includes lab hours that give students a controlled environment in which to work with the equipment they will ultimately gain access to as employees. They also take field trips to oil and gas companies and oil fields. These trips give them a realistic sense of the job and also put students in contact with potential employers. Smith said during the workshop, he simulators and several types of artificial lift systems in detail and visited a working rig. The New Braunfels native met people from around the world representing different companies within the oil and gas industry. Smith said he was able to get business cards and make contacts in the industry that will help him get a job when he graduates. “I felt like I was on par with people already in the field. That made me feel good,” he said. Smith will finish his Associates Degree in Oil and Gas Technology in December 2012. He currently holds a Bachelor of Arts Degree in Political Science and History from Texas Tech University (Lubbock). He worked in sales prior to joining the oil and gas program at Coastal Bend College. He found that he didn’t like the office work and since most of his friends seemed happy in the oil and gas business, Smith made the decision to return to college. Walter Richardson, also in his second semester at the college, has a Bachelor of Arts Degree in Operation Management with a minor in electrical engineering from Remington College (Memphis, Tenn.). After speaking to Lindsey Hagen, CBC career advisor, Richardson felt that the oil and gas program was an appropriate match for his interests and skills. He said his goal is to work in the artificial lift system and get hired by Weatherford, so the opportunity to make contacts in his career field was immeasurable. “They think I might be a good fit for their engineering program. I’ve met the head training manager and exchanged business cards and made contacts for future reference,” Richardson said. He felt well-prepared for the workshop, based on the classroom experiences he’s had at CBC. He expects to complete his AAS degree at CBC in two semesters. The stipend from Weatherford is part of a series of partnerships between the oil and gas program and the industry. Many of the local oil and gas company representatives serve as advisory committee members that annually review CBC’s program to ensure that students gain access to industry-relevant knowledge and skills. For more info on the oil and gas program at Coastal Bend College, visit the web at: http://www.coastalbend.edu/oilgas.